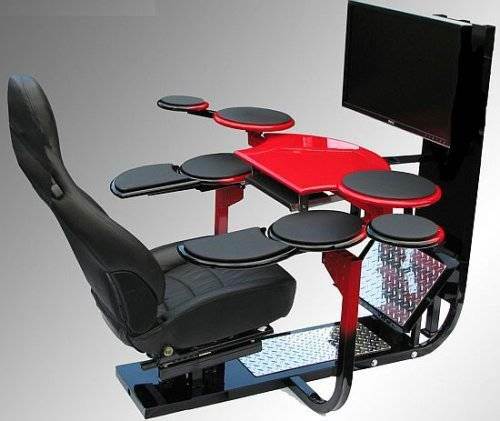 The V1 computer desk can be used as a computer gaming chair, flight simulator, racing simulator, cad workstation, video editing workstation, sound editing workstation, personal movie theater, surround sound music environment and more. Every part of the V1, aside from the seat, is hand machined and welded to perfection. The Corner V1 offers ergonomic comfort, artful design and many outstanding features. When compared to the conventional computer desk, the V1 stands elite. It comes with 2.1 speaker support, designed for two speakers and a subwoofer. There is the flat screen monitor support that is 3 position height-adjustable and touts a premium quality articulating wall mount bracket. Other salient specs are height adjustable and pivoting foot rest and pivoting elbow supports. The custom painted V1 table tops are incredible in appearance and comfort. The sky is the limit when it comes to seating. The most popular seat upgrade is a Porsche Seat that can have up to 12 functions including power lumbar controls and heat. The base price for Corner V1 Computer Desk is US $1,700 that can go higher if you go for optional upgrades.